This weekend, my Taiwanese and I are preparing for today's collective cooking which feature Korean BBQ, we have marinated 6 lbs of meat for about 8 people. We will see tonight how the evening will go. 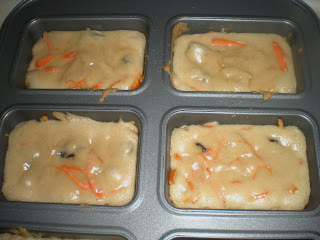 On Saturday, I decided to make carrot bread since we have a lot of carrots left at home. I inspired the recipe from Southern Grace Gourmet which her recipe was featured Top 9 on Foodbuzz. I am always wondering why there is so much sweet in desserts, I usually cut at least 1/4 cup sugar from the original recipe. I wasn't sure if it should be called a bread or cake. I think a cake is only if there is frosting on top of a bread. It is similar to muffin and cupcakes. 2. 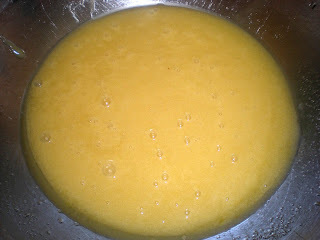 Combine sugar, syrup, salt, egg and oil. 3. Sift flour, baking soda, baking powder and cinnamon. Stir together with a rubber spatula until combined. 4. 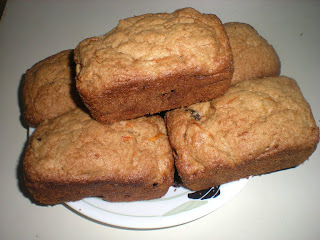 Fold in raisins and carrots to batter. Transfer mixture to baking pan. 5. Bake for 30-35 mins for mini bread and for bread loaf about 50 mins or until toothpick comes out clean.